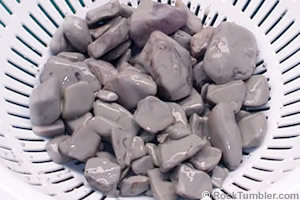 "Rock tumbler grit", also known as "rock polishing grit", is a silicon carbide powder that is much harder than the types of rocks that are commonly polished in a rock tumbler. If it is tumbled in a barrel with rocks and water the abrasion caused by the grit particles rounds the sharp edges off of the rocks. We use about two level tablespoons of grit per pound of rock in a rotary tumbler and 1/2 tablespoon of grit per pound of rock in a vibratory tumbler. This is the grit that most people use in STEP 1 of the rock tumbling process in a rotary tumbler. It is an ungraded 60/90 mesh silicion carbide granule. In a rotary tumbler we use about two level tablespoons of grit per pound of rock. 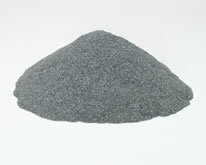 This is the grit used for STEP 2 of the rock tumbling process in a rotary tumbler. It is also used for STEP 1 in a vibratory tumbler. 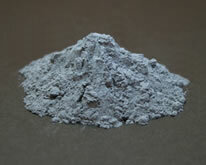 It is an ungraded 150/220 mesh silicon carbide powder. We use about two level tablespoons per pound of rock in a rotary tumbler and about 1/2 level tablespoon per pound of rock in a vibratory tumbler. This is the grit used for STEP 3 of the rotary rock tumbling process and STEP 2 of the vibratory tumbling process. 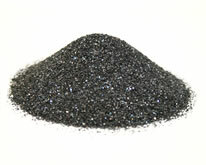 It is a 500F silicon carbide powder that is used immediately before the polishing step. In a rotary tumbler we use about two tablespoons per pound of rock. In vibratory we use about 1/2 tablespoon per pound of rock. .
Stop using the measuring spoon from the kitchen to measure your grit and polish. We use a separate measuring spoon for each grit size to avoid cross-contamination of grit sizes. We keep these spoons in the container with their respective grit size. It's really convenient to have a spoon in the grit container. No more hunting and washing measuring spoons! 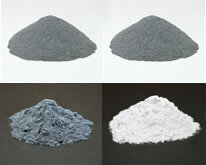 Here are all of the rock polishing grits and polish that you need for a rotary tumbler. 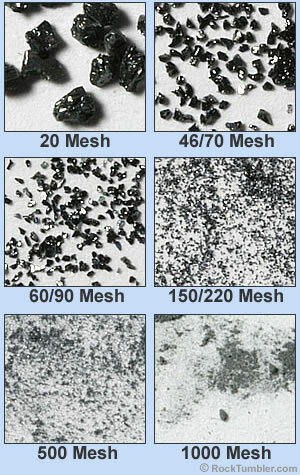 Includes coarse (60/90), medium (150/220) and fine (500F) silicon carbide grit and TXP aluminum oxide rock polish. Buying the large vibratory grit bundle will save you $44.96 over the cost of buying five standard vibratory kits. Your shipping costs will also be lower. This three-step grit kit is designed for use in the Lot-o-Tumbler, the Thumler's Ultra Vibe, and other vibratory rock tumblers. -- This kit contains two pounds of medium grit (150/220), one pound of fine grit (500F), and one-half pound of #61 Rapid Polish (a sub micron aluminum oxide polish). This is enough grit and polish to process many pounds of rocks. More Information. -- If you do a lot of vibtatory tumbling, here's your opportunity to save money with our Large Vibratory Grit Bundle. It contains ten pounds of medium grit (150/220), five pounds of fine grit (500F) and 2.5 pounds of #61 Rapid Polish (a sub micron aluminum oxide polish). 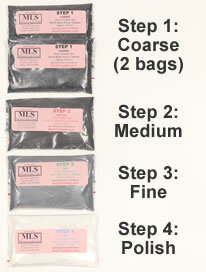 This kit contains 5x as much grit and 4x as much polish as the standard kit for about 3.6x the cost. More Information. These are grit sizes that we don't normally use in our own rock tumbling. However, we do use them occasionally and some people use them on a regular basis. This grit is much coarser than the 60/90 mesh that is normally used in the first step of rock tumbling. We recommend that it be used in tumbler barrels that have a capacity of at least six pounds. It is ineffective in three-pound capacity barrels. Another use is when you are going to allow a barrel of rocks to tumble for one month. In that situation you want a grit that will not break down to small particles before the end of the month. Long-duration tumbling is the only time we use this size grit in our own tumblers. Some people who are trying to achieve the ultimate polish add a 1000 mesh grit step right before polishing. You can get great results without this step, but people who tumble in contests or are working towards the perfect polish think that this step is the way to go. 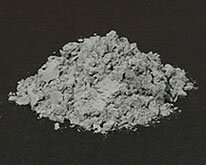 We rarely use 1000 grit in our own tumbling, we get great results on most materials without it. However, we always use 1000 grit as a final step before dry polishing fluorite, calcite, dolomite and other materials with a Mohs hardness of four or less. Q: Can I Use Sand Instead of Rock Tumbler Grit? 1) Silicon carbide grit is very hard. It is much harder than the rocks that most people tumble. On the Mohs Hardness scale silicon carbide has a hardness of 9 to 9.5 while commonly-tumbled rocks such as jasper, agate, quartz and petrified wood have a Mohs Hardness of about 7. 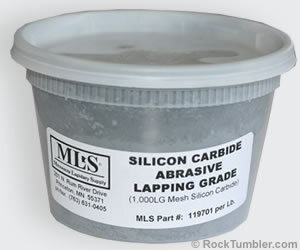 This means that silicon carbide grit can easily abrade the rocks that most people tumble. However, most beach, river, and wind-blown sands are composed of quartz, which has the same hardness as the rocks that most people tumble. Since it has an equal hardness it will be ineffective at abrading them in the tumbler barrel. 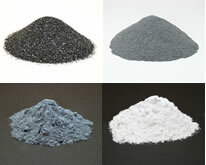 2) Quality silicon carbide grit usually occurs in angular particles. That means they have sharp points and edges that facilitate abrasion on the rocks while tumbling occurs. However, most beach, river, and wind-blown sands have rounded particles, which makes them ineffective at abrading the rocks that you are hoping that they will grind. 3) Rock tumbler grit can easily be purchased in sizes that are perfect for rock tumbling. To duplicate the coarse, medium and fine grits used in rock tumbling you would have to purchase a set of sieves, find sand of various particle sizes and separate it into the grit sizes needed for rock tumbling. We are willing to bet that you will burn more gasoline and time chasing these special particle sizes of sand than you would spend buying some good grit. It isn't that expensive. In summary, you can use sand instead of rock tumbler grit. But, if you do that, the sand may not be effective at cutting the rocks because it has the same hardness as the rocks and it usually occurs in rounded grains. You will probably waste a lot of time and electricity trying to save money using sand instead of rock tumbler grit. We have an article titled "Can I Use Sand Instead of Grit?" that explains this in much more detail. 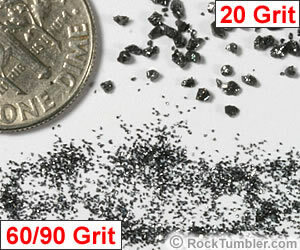 Q: Would You Explain the Grit Sizes Used for Rock Tumbler Grit? Lots of people ask about that. We have an article that describes the man-made material known as "rock tumbler grit" and a chart that explains the various grit sizes. 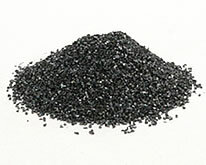 The title of the article is "What is Silicon Carbide Grit?". The Wikipedia article for "silicon carbide" also has a lot of good information. Q: Can I Recycle Rock Tumbler Grit? The practical answer to this question is "no," but we will explain the "yes" part in a few sentences. When you place your loaded barrel on your rock tumbler and turn it on, the particles of grit will become caught between the tumbling rocks in the barrel and each time that occurs the grit places a small scratch in the surface of the rock. Over the hours and days of continuous tumbling this happens millions or billions of times. All of this abrasion wears the sharp edges off of the rocks and smooths their surface. It also does some damage to the grit. The grit particles also break and wear down during the tumbling process. So at the end of a week of tumbling your coarse grit will be in a much larger number of particles and each of those particles will be smaller than what you started with. If you had a screen with a very fine mesh, you could pour the muddy liquid in your tumbler barrel through it and wash all of the mud through. A lot of the granules that remain on that screen would probably be small particles of silicon carbide grit. 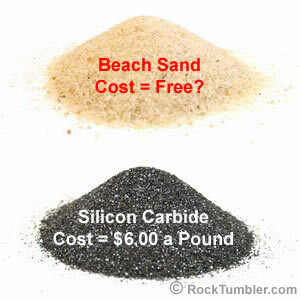 However, it would be "spent" silicon carbide grit and the value of that grit is probably less than the value of the time that you will spend and the soap and water you will spend cleaning-up after your recycling work. If you see grains of grit in the barrel after tumbling instead of trying to recycle it, consider one of these two actions. A) Run the tumbler a few more days to wear out that grit. It will probably improve the roundness and smoothness of your stones. (You might also try using a little less grit if the rocks that you are tumbling have a Mohs Hardness of less than about 6 or 7. These rocks don't wear out the grit as rapidly.) B) Consider that your barrel might have been too full. If you are filling your barrel more than about 2/3 full, your rocks might not have enough room in the barrel to tumble properly. So, the barrel is going round and round and the rocks are in that barrel locked in a big mass. Reducing the amount of rocks by just a little will give them more space to tumble and give your grit a chance to do its job. Q: Why Don't You Use Extra Coarse for Extra Fast Grinding? We used to think that extra coarse grit would be a great idea. Here's a story..... We had some beautiful big pieces of Ohio Flint and they were REALLY REALLY hard. We tumbled them for a full month in 60/90 grit silicon carbide and added 50% extra grit to sustain grinding the entire month. (We also added extra water to dilute a month's worth of mud!) At the end of the pieces had worn down a bit but they still needed a lot more tumbling to get the shape that we wanted. So we bought some 20 grit with the idea that it would tear up that flint quickly. Heh! We added the normal amount of 20 grit and ran the tumbler for a month. At the end of the month we opened the barrel. Lots of that 20 grit had survived! Almost all of it had survived. It was almost the same particle size as when we started - it was only slightly smaller. And the flint still looked just like it did when we started. We have used 20 grit for several other materials with the same results. Why? When you use 20 grit the particles are really big but there are very few of them to do the grinding. However, when you use 60/90 grit there are a LOT more abrasive granules in the barrel and they grind away everywhere. We have also experimented with 54 mesh grit. The particles of 54 grit are much larger than the blend between 60/90 and it is large enough to do more aggressive cutting. However, there are still not nearly as many granules in the barrel to do the work of cutting. In summary, whoever first decided to use 60/90 grit in a rock tumbler knew what they were doing. If you want to read the results of our experiments with extra coarse grit you can find an article here. If you don't believe us and want to try some 20 grit yourself, click this link to add two pounds to your shopping cart for $9.99. Q: Would I Get a Better Polish With a 1000 Grit Step? We use 500 or 600 grit as the final grinding step before polishing 99% of the time. We get great results and do not think that the extra time and expense of a 1000 grit step is needed. We might use a 1000 grit step if we were competing in the Worldwide Rock Tumbling Contest. Otherwise, the only time we use 1000 grit is when we tumble a very soft material such as fluorite or calcite. We use 1000 grit as the last grinding step in a vibratory tumbler. We then do the polishing step dry, in a vibratory tumbler, filled with crushed corn cob that has been treated with Rapid Polish. The entire bowl is filled with corn cob and we only add a few pieces of the rock we are trying to polish. One-thousand grit is really expensive. Save your money.